Share the easy-writing experience with us! Thousands of students all around the world have already joined us. Want to become fit and energized? 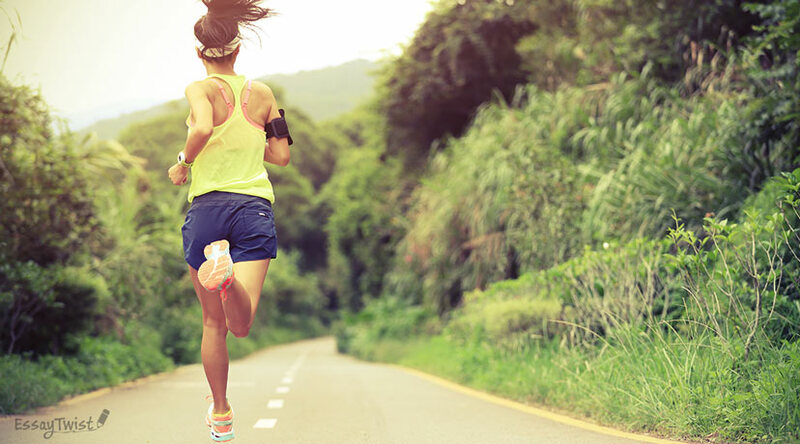 Running is the perfect way to keep your body in fantastic shape and your mind fresh. If you still think running is not for you, you are wrong. It turns out everyone can become a runner if there is a will to start following easy tips and guides. Here are some of them, with these steps you will surely become a runner during your summer break! The truth is, nothing can be done if there is no motivation. It’s very hard to make yourself actually start doing something, but there are a lot of simple ways to motivate yourself. For example, sign yourself up for one of the races a couple of weeks from when you are planning to start running. That could be a perfect motivator for you as surely you’d wish to show your best during the competition. It can become your goal that you will have to pursue and achieve. Now, when you have a specified goal, it’s time to create a perfect plan to reach it. Another good tip will be to have somebody else to run with you so you could cheer each other up and help to avoid missing your training sessions. Create a running schedule that will work for both of you, starting from 2-3 running sessions per week. To make it even easier for you, you can map out the route for your marathons, for example, it could be a quiet park somewhere in the city, just make sure it isn’t an overcrowded place. For the first couple of times, you may alternate running and walking if it’s too hard for you. As you continue your running sessions, it will become easier each time and your walking time should decrease. You should feel comfortable and relaxed during your training, that’s why the right clothes choice is crucial. Make sure to buy the cloth that is made of a breathable fabric and is specially designed for running. A lot of famous sport brands have special lines of clothes created exactly for the running purposes, you may check some of them and choose the things that can satisfy you needs and desires in order to feel easy and relaxed. Make sure to pay additional attention to the shoes choosing as they are, no doubt, the main attribute in the whole set. It’s better to heat your muscles up a little bit before you start, especially for beginners. Just walk for a couple of minutes, then do some stretching exercises in order to prepare your muscles to move. After this, you are ready to begin your training. But don’t try to jump over your head, you are only a beginner! Don’t push yourself too hard during the first sessions. It’s important that you enjoy your training so to have the wish to keep on! Start by mixing walking and running and then reduce your walking time with each session. After the running, it’s important to cool your body down by doing some stretching exercises again. Rated 4.4 | 281 votes. We offer you to order at best prices and the quality will be of the highest standards. In addition to this we always have discounts available. So, just don’t sweat it! Essay writing is an easy thing when you are with our experts!